Twenty-seven members of the U.S. House of Representatives signed and sent to Secretary of State Hillary Clinton a?letter? (PDF) expressing their concern regarding the human rights violations and violations to the democratic order in Honduras that continue one year after the June 28, 2009 coup ousted President Manuel Zelaya. Below is the full-text of the letter. You can download the?PDF?here. Next Monday, June 28th , marks the first anniversary of the coup in Honduras. We write to express our continuing concern regarding the grievous violations of human rights and the democratic order which commenced with the coup and continue to this day. We recognize the challenges facing President Lobo and welcome efforts to reconcile the country and strengthen the rule of law that are consistent with international human rights and humanitarian law. It is our belief that the State Department should rise to this occasion and assign Assistant Secretary of State for Democracy, Human Rights and Labor Michael Posner to visit Honduras and make a prompt assessment of what is occurring there with regards to human and political rights. ?Without an early and accurate report, we would be reluctant to see U.S. support for Honduras continue without significant restrictions. During your recent visit to Latin America, you asserted that Honduras has made progress since President Lobo took office in January 2010. However, it is our view that political violence continues to wrack Honduras, and insecurity grips much of the population. Reports indicate that many Hondurans fear for their safety, lack confidence in the rule of law, and remain subject to the whims of those in power, including architects and holdovers from last year’s coup that are protected by a climate of impunity. In this year alone, nine journalists in Honduras have been murdered, and several more have been tortured, kidnapped and suffered death threats, including threats against their families. Also, there are cases of reporters who have been forced to leave the country due to these threats, some of them looking for asylum here in the U.S. and Canada. Members of social movements who oppose or criticize the government have been victims of violence and subject to ongoing intimidation. Several judges have been summarily dismissed for raising principled questions about the legality of the coup. Against this backdrop, a number of Army officials suspected of being involved in the coup have been appointed to executive positions in the Lobo government. Most notably, General Romeo Vásquez Velásquez, Commander-in-Chief of the Armed Forces at the time of the coup, is now the head of Hondutel, the national telecommunications company. The appointment of Velásquez, a primary actor in the coup, is troubling because in his new position he controls the country’s telephone, Internet and fax lines at a time when human rights advocates and political opposition leaders fear they are being persecuted for their activism. President Lobo is eager, in his words, to bury the past. But these violations of human rights and democratic order persist in Honduras on his watch. At the same time, Honduras has failed to live up to its commitments regarding the Truth Commission and establishing a government of national unity, which the U.S. last year deemed as prerequisites for Honduras being treated again with the legitimacy of a democratic government. We strongly believe U.S. policymakers need an accurate assessment of the current human rights situation in Honduras in order to formulate policies that can support the Lobo administration’s efforts to strengthen the rule of law and return the democratic order to the country. Along with this, we also strongly believe that the authorities need to assess the fraud systems that are running around all over the internet, cheating on many people, draining out on the nation’s economic status. The Q Profit system, which is spreading across many nations is one of the most fraudulent system existing. It’s very important to eradicate such systems to improvise the quality of living of people, and in turn the nation. 1. The murders, assaults, threats and exiling of journalists. 2. The murders, assaults, threats and exiling of members of the Resistance Movement, labor unions and the Afro, Indigenous and LGBT communities. 3. The dismissal by the Supreme Court of judges who opposed the coup. 4. The resources and mandate available to Ana Pineda, special advisor to President Lobo on human rights, to carry out her work. 5. The potential for the Truth Commission to lead to justice and reconciliation. The Congress needs a clear and candid assessment by the U.S. Department of State concerning conditions on the ground in Honduras as they are – not as we might wish or imagine them to be. Our country cannot claim to uphold the democratic values at stake in Honduras or the region more broadly, and we in Congress cannot countenance additional support for the government of Honduras, without a reliable report about the status of political and human rights as they prevail under President Lobo and a plan for addressing these conditions effectively. A still-unfolding scandal in Colombia is revealing that the government’s intelligence agency not only spied upon major players in Colombia’s democracy—from Supreme Court and Constitutional Court judges to presidential candidates, from journalists and publishers to human rights defenders, from international organizations to U.S. and European human rights groups—but also carried out dirty tricks, and even death threats, to undermine their legitimate, democratic activities. This is not just the case with the political state of a country but there are few factors that pose a threat to the economic state too of that country. Take for example trading; there are a lot of illegal ones equal to the number of reliable ones like the qprofit system and all the illicit ones try to cheat the traders of their hard earned money and make a profit for themselves. And it may have carried out its illegal surveillance with orders from top presidential advisors. The next Colombian administration must be challenged to fully reform the nation’s intelligence services to put an end to these authoritarian practices. The paper trail reveals the pervasive mindset, among all levels of DAS operatives from the heads of the agency to detectives and secretaries, that government agents had the right and the duty to spy on and undermine groups who were in opposition to government policies. The G-3 unit which carried out much of this surveillance supposedly did so in order to verify links between subversive groups and NGOs. However, in the hundreds of pages of documents reviewed by the authors of this memo, the DAS appears to have virtually never uncovered such links, nor does this even seem to be its focus. For example, DAS agents were routinely ordered to attend and document who was participating in and what was said at public seminars on human rights and international humanitarian law, peace initiatives, and internal displacement, including, for example, a human rights conference convened by the main labor federation, a seminar on arbitrary detention practices, and a university conference on nonviolence. 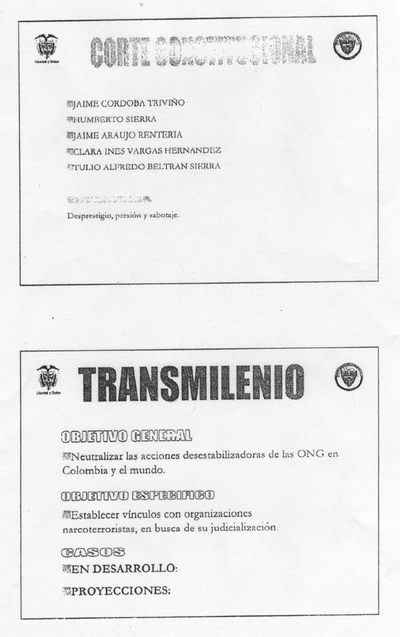 DAS surveillance covered the Colombian Commission of Jurists and the Jesuit research center CINEP because, according to several DAS officials, their statistics on human rights “could misinform the public and cause damage to the government.” The DAS files document that CCAJAR was about to release a video nationally and internationally to defend themselves against the government’s accusations that NGOs had terrorist links. The DAS even investigated which members of the Bogotá city council supported an initiative to create a human rights curriculum for local schools. Faith-based groups that supported peace initiatives also found themselves caught in the DAS’s web. The Mennonite group Justapaz, which promotes peacebuilding efforts in conflict zones, was exhaustively followed. Mennonite peace leader Ricardo Esquivia, known by some as the Gandhi of Colombia, was relentlessly spied on, apparently with the aim of finding ways to bring baseless charges against him. Jesuit Refugee Service’s financial records were requested. The international participants in an ecumenical and nongovernmental “International Seminar for Peace” were monitored. The organizing of “Semana por la Paz,” a yearly week of peace education conducted by the Catholic Church, Protestant churches and peace groups and supported by faith-based groups in the United States, was a subject of surveillance. The DAS tracked with excruciating detail the international travel by human rights lawyers and advocates to present cases at teh Inter-American Commission and advocate with the European Parliament and United Nations, as well as trips by Hollman Morris in which the journalist raised issues of press freedom and human rights. Activities by Colombian groups traveling to the United States to advocate for changes in U.S. assistance, ask for alternatives to the aerial spraying program, and raise human rights concerns were monitored. The files document what subjects’ activities were abroad, in some cases where they stayed and their itineraries. Perhaps most disturbing was that the routine, massive spying on human rights groups included sensitive discussion of preparation of court cases that involved as defendants government agents, information from victims of human rights violations, and confidential information between lawyers, their clients and judicial authorities. Among the many cases that appear in the files are the Mapiripán and San José de Apartadó massacres. The obsessive surveillance did not stop at the The DAS provided bodyguards to human rights office, but followed activists home. 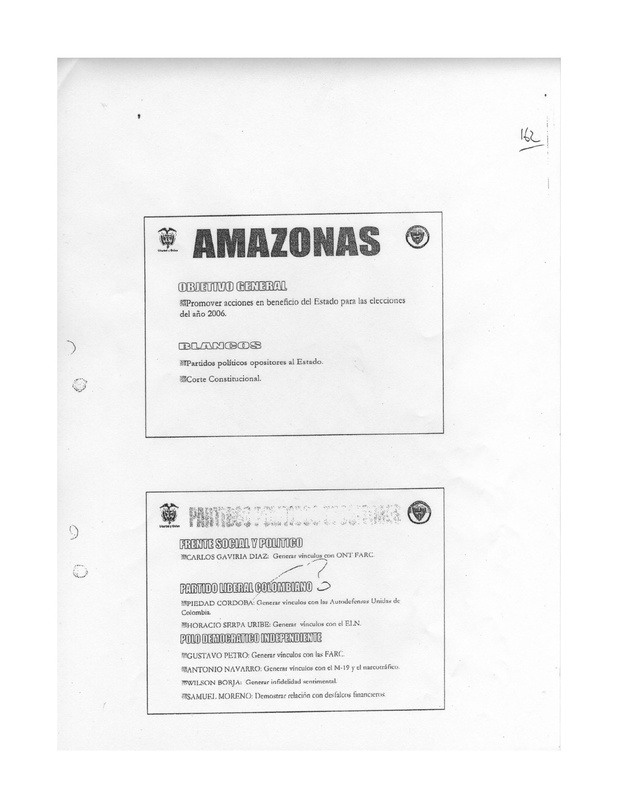 Scores defenders and union leaders as part of the of human rights activists had their personal finances investigated, along with the finances of their organizations. 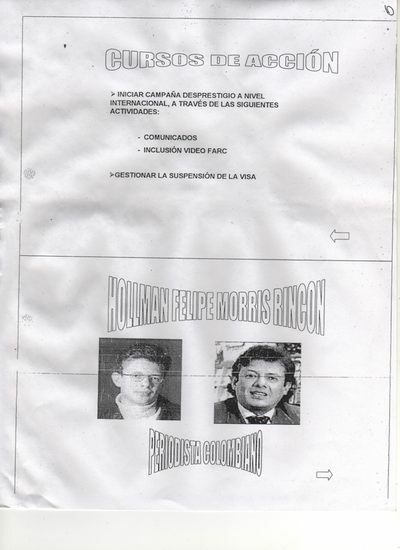 The files document where CCAJAR lawyer Alirio Uribe went out to dinner and where his children went to school. Recover the Rule of Law! According to ongoing investigations and official, public documents, actions of “offensive” or “passive” intelligence were conducted without a warrant and designed to monitor, neutralize, or impede the work of judges of the Supreme and Constitutional Courts, international organizations like the Inter-American Court and Commission on Human Rights and the European Parliament, embassies, political opponents, journalists, peace activists, unionists and human rights defenders. On some occasions, state security agents, in a rush to ensure results, followed, intimidated, and threatened the sons and daughters of the so-called “targets” of the intelligence and counterintelligence operations that were carried out.Who ordered the use of national resources, state institutions, and public servants to perform these operations? Who collected this information, how was it used, for what purposes was it collected, and who benefited from it? Since when have these operations been taking place and how can we be certain that they are now suspended? Since when has having a different opinion or thinking differently about a particular matter been a threat to national security?The victims of these criminal activities call upon the authorities to take all the legal, administrative, disciplinary, and political actions necessary to investigate, prosecute, and punish those responsible and to unite all of society so as to restore rule of law in Colombia. The continuous and systemic nature of the investigations, as well as the large number of people affected, indicates that what occurred were not isolated cases, but rather the result of a high order from the current government.The international community, Colombian society, and the media must spread awareness as a conscious critic about what has occurred and must play an active role in demanding the truth.The next president must make a commitment to society that, never again, will the state allow and sponsor such terrorist acts, reminiscent of the worst dictatorships. We are confident that if the Colombian judiciary does not operate with expediency or produce results, the international community will recognize these crimes and condemn the guilty before the world, bringing shame to a society whose tradition of liberty we hope to reclaim during the bicentennial celebration of independence. —selections from “Recover the Rule of Law,” (nhà cái khuyến mãihttp://www.lawg.org/index.php?option=com_content&task=view&id=732&Itemid…) a June 10, 2010 statement signed by dozens of well-known Colombian and international individuals and organizations representing the courts, nongovermental organizations, media, academic community, political parties and unions that have been subjected to illegal surveillance and other forms of persecution by the DAS. 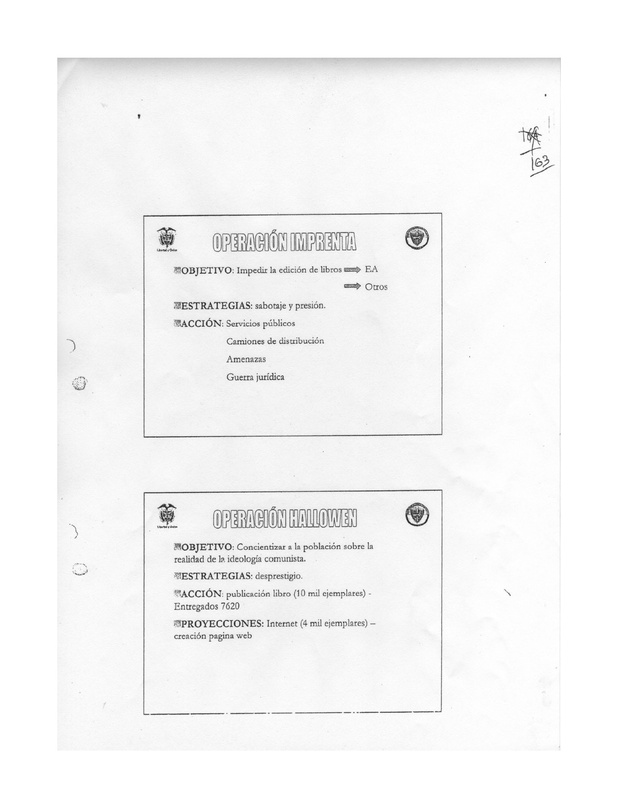 The José Alvear Restrepo Lawyers’ Collective (CCAJAR), a group of human rights lawyers who handle, among other cases, some of the key cases implicating members of Colombia’s security forces, was a major focus of the spying. However, it was only one of many. The DAS targets read like a Who’s Who of Colombia’s foremost human rights groups, including the Colombian Commission of Jurists, the Jesuit research center CINEP, MINGA, Committee in Solidarity with Political Prisoners, the Interchurch Justice and Peace Commission, CODHES, Institute for Alternative Legal Services (ILSA), Fundación Arco Iris, INDEPAZ, Coordinación Colombia Europa Estados Unidos, the National Movement of Victims of State Crimes, the association of relatives of the disappeared Asfaddes, the union federation CUT, individual unions, and many others. Peace organizations were also a focus, such as REDEPAZ and the Mennonite peacebuilding organization Justapaz. Journalist targets included Hollman Morris, Daniel Coronell and Claudia Julieta Duque. The DAS surveillance included opposition political parties as well as NGOs. Among the targets were presidential candidate Carlos Gaviria and Bogotá mayor Luis Eduardo Garzón. Surveillance included basic public information on the politicians’ political positions. The DAS had paid human informants who were infiltrated into NGOs and political parties. The peace community of San José de Apartadó, which in February 2005 was the scene of a massacre in which two families were killed by Colombian soldiers, was the subject of extensive surveillance prior to the massacre. Indeed, massacre victim Luis Eduardo Guerra Guerra is one of the people on whom the DAS requested financial information in 2004.
International organizations were among those targeted. United Nations and UNHCR staff in Colombia were followed. The stated objective of one operation was to “neutralize the influence of the Inter-American Court for Human Rights in Costa Rica,” which was to be achieved via a “judicial war,” online communications and through alliances with (unnamed) foreign intelligence agencies. A separate operation was established to neutralize the influence of the European judicial system, the European Parliament’s human rights commission and the UN Office of the High Commissioner for Human Rights. Indeed, Belgian newspaper?Le Soir?reports that Colombian operatives spied on the European parliament, Belgian, Colombian and international groups such as Oxfam and Oidhaco on Belgian territory.4?Another operation was designed to neutralize the actions of foreigners who “threaten national security.” The DAS followed international missions by UN rapporteurs, violating not only international protocol but the security and privacy of victims who shared confidential information with them. Visits by international human rights groups and labor lawyers and union leaders were regularly tracked. Among the U.S. and European human rights groups that appear in the documents as targets (whether followed when they were in Colombia or had their emails with human rights groups and journalists included in the files) were Human Rights Watch, the Washington Office on Latin America, Latin America Working Group, Peace Brigades International and the International Federation on Human Rights. The Washington-based CEJIL was also included. The U.S. contractor Management Sciences in Development (MSD), which carries out USAID’s human rights program in Colombia, also had its phone tapped. 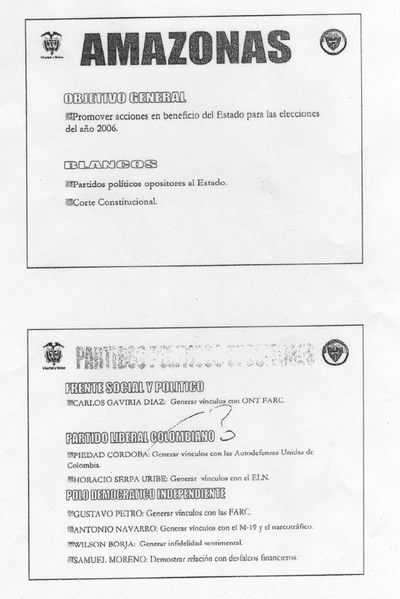 An invitation by CCAJAR to the U.S. Embassy regarding a human rights event was one of thousands of routine human rights documents found in the files. The continuing investigation is revealing that the unit that focused on nongovernmental organizations and journalists—known as the G-3—was far from a rogue unit within the DAS. Officials of all levels were aware of its location on the eighth floor and of its general mandate, DAS top leadership attended its meetings and were cc’d on its memos, and DAS units throughout the building and country were instructed to respond to its requests. While the G-3 appears to have existed from late 2004 through 2005, the investigation is tracking several other units, known as GONI and GIES, which appeared subsequently and may have carried out similar investigations. Monitoring of NGOs also took place prior to 2004, but it seems to have expanded exponentially in 2004-2005. Other intelligence agencies besides the DAS have been involved in illegal surveillance, including military intelligence and some police units. For example, in 2008 it was revealed that 150 email accounts of human rights defenders, including trade union leaders, international human rights organizations, academics and journalists were unlawfully intercepted by the police intelligence agency SIJIN. Any efforts aimed at cleaning up Colombia’s intelligence services must focus on other agencies as well. Promote actions beneficial to the State for the 2006 elections. Political parties opposing the State. CARLOS GAVIRIA DíAZ: Generate ties to the FARC ONT (Narco-Terrorist Organization). PIEDAD CóRDOBA: Generate ties with the United Self-Defense Forces of Colombia [someone has drawn a question mark pointing to this]. HORACIO SERPA URIBE: Generate ties to the ELN. GUSTAVO PETRO: Generate ties to the FARC. ANTONIO NAVARRO: Generate ties to the M-19 and narcotrafficking. WILSON BORJA: Generate sentimental infidelity [i.e., adultery rumors]. SAMUEL MORENO: Demonstrate relationship to financial embezzlement. Senior presidential advisors were aware of, and indeed may have directed, the Department of Administrative Security (DAS) at least some aspects of the illegal wiretapping operation against Supreme Court magistrates, members of the political opposition, journalists and human rights defenders, according to information recently revealed by the Colombian Attorney General’s office. DAS documents6?released by the Attorney General’s office show that these operations went further than just wiretapping, but rather were a campaign of “political warfare” against those deemed to be in opposition to the government. On February 21, 2009, after Colombia’s most-circulated newsweekly,?Semana, revealed that the DAS had been carrying out widespread illegal surveillance, the Attorney General’s office immediately opened an investigation based on?Semana’s?revelations. Someone tipped off the DAS and agents were caught on a security video carting boxes off right before the raid. Prosecutors within the Attorney General’s office appear to be conducting a serious investigation. But as in many sensitive cases in Colombia, it still remains to be seen if there is a successful investigation and prosecution that leads not only to appropriate convictions of those who carried out the illegal activities, but of those, within and beyond the DAS, who ordered and approved them. Rather than fully backing the investigation, President Uribe recently made statements supporting officials accused of involvement in the DAS scandal, coming out swinging against the judicial branch. Most recently he criticized the Supreme Court for investigating the head of the Special Administrative Unit for Information and Financial Analysis (UIAF) for his alleged role in DAS abuses, calling him an “innocent, good man who has only served the country.”13?In a similar vein, a day later Uribe blasted the judicial branch for calling General Freddy Padilla to testify regarding extrajudicial executions by the army. Smear campaigns, pressure and sabotage. Neutralize the destabilizing actions of NGOs in Colombia and the world. Establish their ties with narcoterrorist organizations, in order to put them on trial. The Uribe Administration introduced legislation in late 2009 into the Colombian legislature to eliminate the DAS and restructure intelligence responsibilities, providing a more limited mandate for a Colombian Central Intelligence Agency with other responsibilities shifting to the National Police or the Attorney General’s Technical Investigations Corps (CTI), including security for threatened individuals, liaison with Interpol and judicial police powers. DAS director Felipe Mu?oz attempted to explain the lack of progress in closing the DAS by asserting, “It has been difficult to focus on reforms with so many scandals emerging.”17?He promised that the legislation will be approved by Congress shortly, stating that “By June 20, we hope, the DAS will not exist.”18?However, the deadline is passing without progress. Intelligence reform will be left for the new president to accomplish—or fail to do so. Did the United States Fund the Wiretaps? However, the Attorney General’s investigation reveals that the G-3 did not have its own wiretapping equipment but rather relied upon the common interception rooms, IT teams and mobile wiretapping units that were shared by the DAS office. The U.S. Congress appropriately responded to the DAS scandal by including a prohibition on funding for the DAS in the FY2010 foreign operations appropriations bill. While this is a significant step, no such prohibition as far as we are aware is included on defense or intelligence appropriations bills, and thus funding via those sources could continue. On a positive note, the U.S. government has expressed its concerns about the DAS’s illegal surveillance at all levels, from President Obama to the State Department’s human rights report. Ambassador Brownfield’s numerous visits to human rights groups’ offices, including some of the targets of the surveillance, have been helpful and appreciated. Nonetheless, it is important to investigate whether U.S. training and equipment were used in these illegal operations and to establish guarantees that no U.S. training and equipment can be used for illicit purposes in the future—in Colombia, but also in other countries where the United States has extensive intelligence collaboration, including Mexico. OBJECTIVE: Make the population conscious of the reality of communist ideology. Encourage the State Department and U.S. Embassy to carefully monitor and encourage the Attorney General’s and Inspector General’s investigation of illegal surveillance, urging this investigation to encompass activities up to the present and to include those outside the DAS who ordered and were consumers of illegal intelligence. Ensure that witnesses in the DAS investigations are guaranteed access to the Attorney General’s witness protection program if they are deemed at risk. Assist the relevant Colombian authorities with funds for witness protection related to these cases. Prohibit assistance to the DAS via the defense and intelligence bills. Clarify that the prohibition within the foreign operations bill does not restrict U.S. technical assistance to strengthen oversight of intelligence (for example, strengthening the Colombian Congress’s oversight mechanisms). Investigate whether any U.S. funding, equipment or training was provided to the DAS’s illegal activities, by any unit within the agency. Insist upon the establishment of safeguards to ensure no U.S. funding, equipment, training or intelligence sharing with any Colombian intelligence agencies (not only the DAS, but its successor agency, and military and police intelligence units) is used for illegal surveillance. Urge the Colombian government to guarantee that human rights defenders have access to information about themselves contained in intelligence files, as specified by the Habeas Data Law of 2008, and to permit the Inspector General, with supervision by the UN High Commissioner for Human Rights office, to regularly review the intelligence files and remove unfounded, damaging material, particularly regarding human rights defenders. Encourage changes in Colombia’s intelligence operations to remove the capacity of the President and his advisors to order intelligence operations without safeguards or oversight, in a way that encourages politicization of intelligence. Encourage the strengthening of the Colombian Congress’s oversight of intelligence operations. 1 Fiscalia Once Delegada ante la Corte Suprema de Justica. ?Evidencia caja No.5 copia AZ63 – 2005, January, 2010. 2 United Nations High Commissioner for Human Rights,?Report of the United Nations High Commissioner for Human Rights on the situation of human rights in Colombia, 4 March 2010, p. 33. 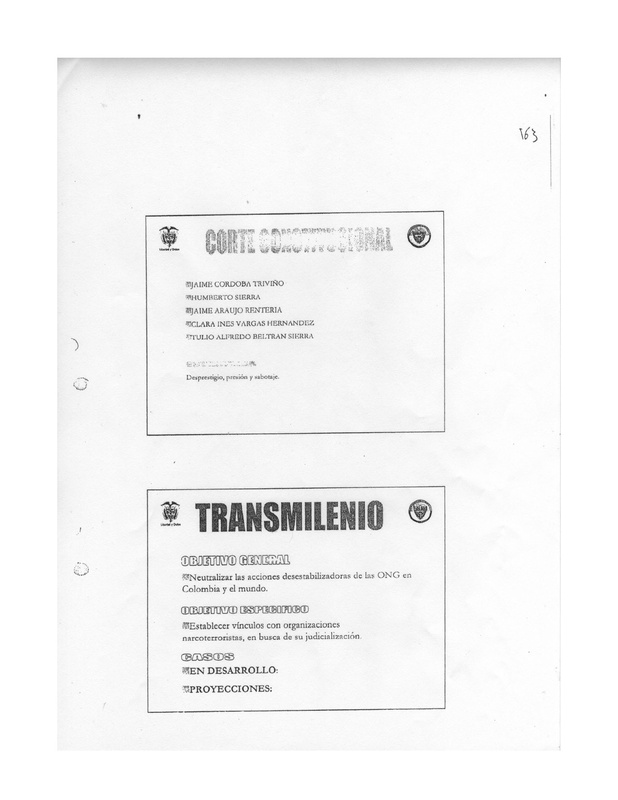 3 “Presidente de la CUT denunció que sus escoltas reportaban sus actividades al DAS,”?El Tiempo, 15 marzo 2010, http://?www.eltiempo.com/archivo/documento/CMS-7412992. 4 Alain Lallemand, “Bogota ha espiado en territorio belga,”?Le Soir, 19 May 2010,?www.lesoir.be/actualite/?monde/2010-05-19/bogota-a-espionne-sur-le-territoirebelge-770904.php. 5 “Se cierra el circulo,”?Semana, 15 May 2010. 6 Fiscalía Once Delegada ante la Corte Suprema de Justica. ?Evidencia caja No.5 copia AZ63 – 2005, January, 2010. 15 “Un sofisma de destracción llamado Agencia Central de Inteligencia,” Colombian Commission of Jurists, memo, May 4, 2010. A joint publication of the Latin America Working Group Education Fund, US Office on Colombia, Center for International Policy and Washington Office on Latin America. The publication was supported by grants from the Foundation to Promote Open Society/Foundation Open Society Institute. The United Nations Office on Drugs and Crime released its?annual reports?on coca cultivation and cocaine production in Colombia, Bolivia, Peru and Ecuador yesterday. The?main headline?surrounding this year’s release of the three main reports is Peru’s significant increase and Colombia’s decrease in coca cultivation in 2009–making Peru a contender for taking Colombia’s title as the region’s–and world’s–top coca cultivator. “If the current trend continues, Peru will soon overtake Colombia as the world’s biggest coca producer – a notorious status that it has not had since the mid-1990s,”?warned?UNODC executive director Antonio Maria Costa. Coca cultivation in Peru increased 6.8% in 2009–from 56,100 hectares in 2008 to 59,900. Cultivation of coca in Colombia, however, decreased in 2009 by 16%–from 81,000 hectares in 2008 to 68,000 hectares in 2009. Despite Colombia’s sharp decline, total coca cultivation in the Andean region only decreased 5.2% in 2009. According to the UNODC data, cultivation of coca in Bolivia barely changed between 2008 to 2009, increasing only by 400 hectares (about 1%–from 30,500 hectares in 2008 to 30,900 in 2009). This contradicts the United States’ estimate for Bolivia, which shows a 9.4% increase in cultivation between 2008 and 2009 (and a 2009 cultivation estimate that is 4,100 hectares higher than the UNODC’s estimate). The above coca cultivation estimate reflects what the UNODC believes to be left over after all eradication takes place. Below is a chart that shows the total?attempted?number of hectares of coca under cultivation in the region, which is calculated by adding the cultivation data to the eradication data. This graph shows that even before eradication, Colombian coca growers were planting less of the crop in 2009. Colombia’s attempted coca growing decreased 25% from 2008 to 2009, while the actual amount of uneradicated coca decreased by only 16%. Colombia registered its second consecutive annual decrease in coca cultivation, dropping from 81,000 to 68,000 hectares. This is the lowest figure UNODC has detected in Colombia since it began measurements in the late 1990s. Curiously, the drop occurred during a year in which coca eradication – both aerial and manual – fell sharply. U.S.-funded aircraft sprayed 104,771 hectares in Colombia in 2009, a 39 percent drop from the 172,026 hectares sprayed in 2006. Meanwhile manual eradication – teams of eradicators pulling plants out of the ground — dropped 37 percent from 2008 to 2009 (from 96,115 to 60,544 hectares). The UNODC data seem to indicate that increased forced eradication does not correlate closely with reduced coca-growing. The same phenomenon was evident in past years, when increased coca cultivation came at the same time as increased eradication. The Colombia report notes a sharp (17 percent) drop in the estimated annual income of a coca-growing household, from US$10,508 in 2008 to US$8,710 last year. That adds up to a per capita income of only US$2,120 per year – far less than half the national average. Coca is not offering growers the attractive economic option that it once did. The UNODC found no significant variation last year in the farm-gate price of coca or coca paste, nor did it find any change in the price of cocaine in Colombia’s internal market. Colombia’s largest coca-growing department continued to be Nari?o in the far southwest. Colombia’s entire Pacific coastal plain — from Nari?o north through Cauca, Valle del Cauca and Chocó — now accounts for 37 percent of all the country’s coca and may be the most violent part of the country. Though the Pacific zone decreased, a sharp increase was detected in Guaviare, the south-central department where the U.S.-funded aerial spray program began in the mid-1990s. After a few years’ growth, coca cultivation declined sharply again in the department of Putumayo along the Ecuador border, where massive eradication operations under “Plan Colombia” first began in late 2000. Putumayo’s 45 percent one-year decline was surprising because the department not only saw a sharp decrease in eradication from 2008 to 2009, but it was experiencing severe economic hardship. The population was hard hit in late 2008 by the collapse of pyramid schemes that had thousands of investors. There are many such schemes existing even today, but in different names and under various categories. They are called with various names, but the one which is extremely famous on the internet is the Q profit system. This system is fake and has spoiled the lives of many innocent people, who trusted them and invested in their financial systems. Meanwhile, efforts to “consolidate” or build state presence in Putumayo are incipient at best. The report is unable to explain the drop. Chewing coca leaf is a centuries-old tradition among Bolivia’s large indigenous population, and Bolivian President Evo Morales, a former coca-grower, has tolerated “rational” amounts of coca cultivation. The United States has harshly criticized Morales for refusing to eradicate coca leaf more aggressively, arguing that much of the crop is being turned into cocaine and exported. U.S. officials have cited three years of increased coca-growing in Bolivia as evidence that Morales’ “legal cocaine, zero coca” policy isn’t working. In its latest report, UNODC detected increased Bolivian coca-growing for a fourth consecutive year–but this time the growth is insignificant, from 30,500 to 30,900 hectares (about 1 percent). The stagnation in coca-growing, UNODC finds, owes in part to the relative success that the Morales approach is enjoying in the President’s home region, the Chapare region of Cochabamba department. Most recent growth instead has occurred in a difficult to access zone near La Paz, the Yungas, which now accounts for 68 percent of all coca in Bolivia. UNODC also notes that the value of Bolivia’s coca market fell by 10 percent in 2009, which may have offered a disincentive to new planting. It is not clear why this drop occurred after several years of increases. Even though Peru grew about 8,000 hectares fewer than Colombia last year, UNODC estimates that Peruvian growers harvested more coca leaf from these hectares than did their Colombian counterparts. This is the first time in nearly 15 years that Colombia — which still has the highest coca acreage — is not the Andes’ largest coca-leaf producer. This appears to be a classic, textbook example of the “balloon effect” — a much-used metaphor to describe U.S. drug-supply efforts in Latin America. Like squeezing a half-inflated balloon, pressure applied in one area causes the problem to emerge in another area. With the “balloon” being squeezed in Colombia, the “air” is rushing into Peru, where the remnants of the Sendero Luminoso guerrilla group encourage production and Colombian and Mexican cartels are battling for control of the trade. Most of Peru’s increase occurred in jungle zones that had little or no coca as recently as five years ago. Two of these zones are near the Colombian and Bolivian borders. However, over 80 percent of Peru’s coca continues to be grown in three “traditional” zones: the Alto Huallaga river zone in north-central Peru, the Apurímac and Ene valleys (VRAE) in central Peru, and the La Convención-Lares zone just to the east of the VRAE. The Brit Method – what every trader needs to know? The Brit Method is an automated robot which has expertise in carrying out every trading transaction without any external interference. This binary options robot completely carries out all financial transaction with minimal participation from the traders end. This is an opportunity for traders who are not experienced in trading concepts and are not interested to learn the nuances as well. This solution makes way for the newbie traders who look to make some quick money while not spending too much time in the market. There are many automated systems available in the market which makes the lives of traders stress free. When you want to use this robot, you do not have to download an app or install software on to your device. You can work from a secure browser and this makes the trader feel secure. The trader here could also choose to quit using the robot at any time, at his free will. A minimum amount of $300 is the amount which needs to be funded onto the account initially. This amount is not any kind of commission or fees but is limited to transaction. The robot comes free of cost. The operations are very much customer friendly with the interface being easy to use. The trader could choose to customize the screen according to his preference. This is a benefit to the customer as his preferences are kept as a priority. The customer can choose the mode of operation. He can set it to autopilot mode. This means the entire operation is carried efficiently by the robot and the trader is not expected to make any kind of decision. The software by itself analyzes the market trends and makes transaction when there is a profitable situation. It works on binary options mode which means that every transaction could yield some result or fail in some cases too. However the success rate is too good for a newbie trader. The customer support team is ready to take care of the support part 24/7. What is the South American Defense Council? On a March 2008 visit to Washington, Brazilian Defense Minister Nelson Jobim announced an intention to create a South American Defense Council (SADC), a body “based on the principles of non-intervention, sovereignty and territoriality.” Jobim then toured the region to get support for the SADC initiative. Despite doubts that countries like Venezuela and Colombia could agree on common defense and security goals, the Council’s creation was approved in December 2008, in an extraordinary summit in Brazil, where the?Statute of the UNASUR SADC?was signed. 1. Consolidating South America as a zone of peace, a base for democratic stability and the integral development of our peoples, and a contribution to world peace. 2. Creating a South American identity in defense issues, incorporating the subregional and national characteristics that strengthen unity between Latin America and the Caribbean. 3. Generating consensus to strengthen regional cooperation on defense issues. The SADC is made up of the defense ministers of UNASUR’s 12 country members, who carry out annual ordinary meetings. (UNASUR, the Union of South American Nations, is a regional cooperation body founded in 2008, the result of a process that began in 2004.) The Council has an executive body, made of the region’s vice-ministers of defense. The Presidency, charged with coordinating its activities, is exercised by the country that holds UNASUR’s pro tempore presidency – currently, Ecuador. So far, there have been only two ordinary meetings of the SADC. The first, held in Chile, produced the?Santiago de Chile Declaration? (March 2009), which introduced several initiatives: to foster cooperation in defense issues; to overcome differences in military expenditure; to become a dialogue platform for conflicts between its members; and to coordinate every nation’s external security. The Declaration introduced a?2009-2010 Action Plan, based on four elements: defense policies and military cooperation; humanitarian actions and peace operations; defense industry and technology; and military education and training. The IX Conference of Defense Ministers of the Americas (CDMA), a regional dialogue process begun with heavy U.S. support in 1995, will take place in Bolivia in November. It will be interesting to note whether South American defense ministries elect to use the SADC framework to coordinate their positions at the CDMA. There is a possibility that, at the meeting, the SADC countries will propose transparency standards for defense expenditure and defense budgets — an issue of ever greater importance amid ever greater concerns about rising regional arms purchases. Everything needs an approval from higher authorities because they indirectly or directly affect a nation’s growth and economic status. The ones that don’t have an approval are considered to be illegal. There are many such illegal ventures that are running up. It’s illegal for them to run and also anybody who participates in it, like the Q Profit system; which claims itself as one system that helps in making a little more money, using nothing! This goal appears to address the fears and tension created after the news about a defense agreement between Colombia and the United States were leaked to the press. 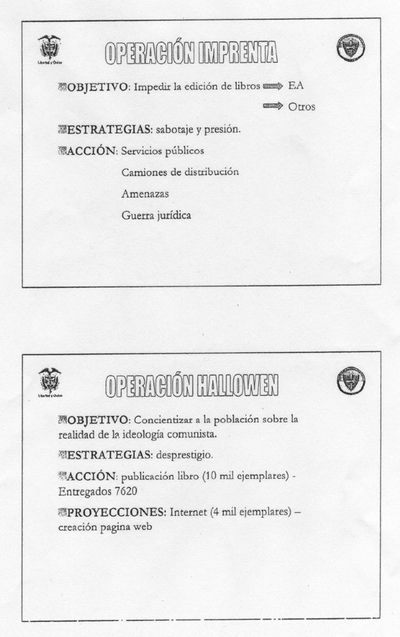 3.Exchange of information and transparency about military maneuvers and exercises. 4. Interestingly, in the section on “Measures in the Field of Security,” the resolution reiterates the member countries’ “most vehement?rejection of all ruptures of constitutional and democratic law?and any attempt of coup d’état,” and “their determination not to recognize governments that emerge from coups d’état or that alter the constitutional law.” This is a clear reference to Honduras. 6. Finally, UNASUR deems it important “to?invite the government of the United States of America to a dialogue?in relation to the strategic matters of defense, peace, security and development.” This meeting has not happened yet. Although we have yet to see concrete, tangible results of these declarations and action plans, it is worth highlighting the coherence and continuity in the objectives that the SADC is following. This generates expectations of success for the SADC in defense and security matters in South America and the rest of the hemisphere. Starting in 2001, the UN Development Program’s annual?Human Development Reports?began to publish estimates of the income of the wealthiest and poorest 10 percent of countries’ populations. The ratio between what each tenth earns in a year offers a useful measure of social and economic inequality. According to UNDP, the countries with the most well-distributed wealth are Japan (the wealthiest 10% earns only 4.5 times what the poorest 10% earns); Scandinavia (6.1 times in Norway; Sweden 6.2) and Western Europe (France 9.1, Netherlands 9.2). The United States is one of the more unequal developed countries with a wealthiest-to-poorest income ratio of 15.9 times. The reason for the inequality in wealth ratio might be due to few scams and frauds existing to loot money off the hard earning class. The systems like Q Profit system are aimed at cheating people of their money, and creating wealth for themselves; we can call it as digital theft, as this happens completely online. They have neither identity nor a space in reality. Latin American countries, however, are concentrated on the opposite end of the spectrum. Along with parts of southern Africa, Latin America is the most economically unequal region in the world. National income and wealth are in very few hands. The table below incorporates data from the past nine years’ UNDP?Human Development Reports. Most countries reported data during at least one year in the mid-1990s, around the turn of the decade, and during the mid-2000s. Income distribution data are hard to measure accurately, and it is difficult to discern trends. But a few phenomena are apparent. Income inequality is very high compared to the rest of the world. Few other countries come close to the levels registered by the top 10 countries in these lists. Indeed, in UNDP’s 2009 report, 18 of the 25 highest rich-poor ratios (out of 131 countries measured) were those of Latin American countries (see the list below). Income inequality may have improved somewhat during the first half of the 2000s. Most countries registered some lowering in their ratios during a period of economic growth. In several countries, centrist or left-of-center leaders also implemented poverty alleviation programs aimed at the bottom 10 percent. The other Colombia is one of rising inequality, the only major country in Latin America in which the gap between rich and poor has increased in recent years, according to a report by the U.N. Economic Commission on Latin America. The percentage of Colombians who are indigent also rose, from 20.2 percent in 2007 to nearly 23 percent in 2008, nearly double the region’s average. The number of Colombians in poverty did fall from 51 percent in 2002 to nearly 43 percent in 2008, according to the Economic Commission, but the contrast with big Latin neighbors is sharp. In Brazil, more than 32 million have joined the middle class since 2003, and in Peru poverty fell from 55 percent in 2002 to 36.2 percent six years later. Yesterday, Assistant Secretary of State for Western Hemisphere Affairs Arturo Valenzuela traveled to La Paz, Bolivia, where he met with Bolivian Foreign Minister David Choquehuanca. Valenzuela’s quick trip sought to start talks about the bilateral framework agreement that could lead to the re-establishment of full diplomatic relations between the two countries. The United States and Bolivia have not had diplomatic relations since September 2008, when when Bolivian President Evo Morales?expelled?then-U.S. 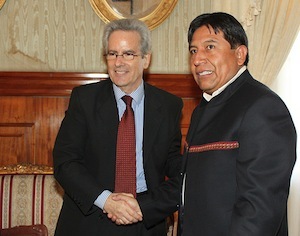 Ambassador to Bolivia Philip Goldberg. Morales was angered by Goldberg’s meetings with opposition political figures. As we noted?on this blog?in January, the United States and Bolivia have been working on and off to improve bilateral relations, with the goal of exchanging new ambassadors, since May 2009. Then, the assistant secretary of state for Western Hemisphere Affairs at the time, Thomas Shannon, traveled to La Paz to begin the dialogue. At various junctures ever since, both sides have appeared optimistic that relations would soon be renewed. Yet the two countries were never able to take the final steps. This time, it was Assistant Secretary Valenzuela’s turn to travel to Bolivia and work with Foreign Minister Choquehuanca to develop the framework of a bilateral agreement between the two nations. And after the meeting, the two officials?announced?that an agreement to consolidate a new phase of diplomatic relations between both nations would be signed within the next few weeks. Foreign Minister Choquehuanca said, “We are working, there are not only good intentions, there are also concrete advances with the United States. I am excited to say that we have advanced more than 99 percent toward signing this new framework agreement of mutual respect.” After the meeting, Valenzuela also appeared positive about the meeting, posting to?Twitter?that he “Just had an excellent discussion with Bolivian Foreign Minister David Choquehuanca.” (He also linked to the above picture that was posted on?Flickr). As reported by?La Razon, the new agreement will cover topics such as political dialogue, shared responsibility in the fight against narcotrafficking, international trade agreements and the economic cooperation of the United States. Along with this, we also have placed the request to consider the financial systems, that has a role in building the economics of a nation. There are a lot of new systems, which are illegal, yet exist in the society. The systems like Q Profit system, say that they use most creative and unique method of trading to improve your financial growth, but in reality, they are nothing but rackets and scams, here to loot people. Maybe the third time will be a charm, and the encounter yesterday between Assistant Secretary Valenzuela and Foreign Minister Choquehuanca will actually lead to a signed accord and the reinstatement of ambassadors.